Photo . 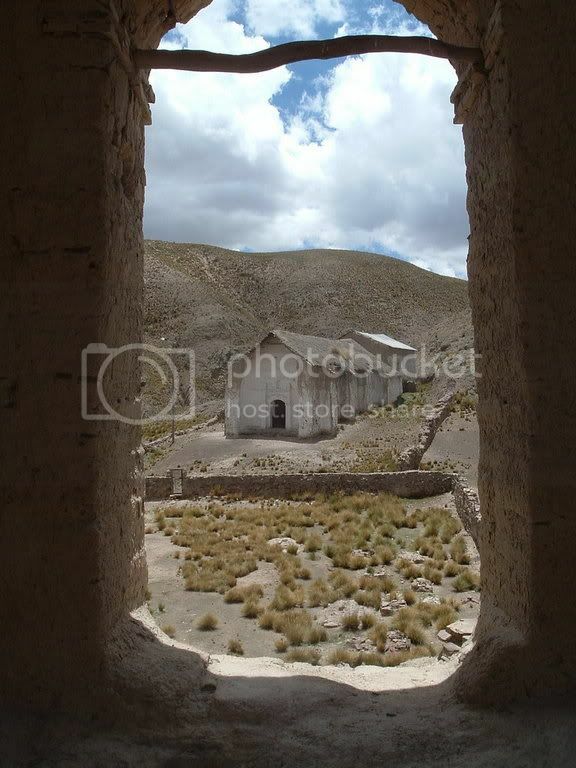 Pretty cool old adobe church outside of Oruro on the way to the Cala Cala rock paintings. Photo . Some BIG country at Cala Cala. The plains here are at 12,000 plus feet. Pretty high. Photo . Another old church on the road from Cocha to Oruro and La Paz. I took this from the old bell tower. It's a pretty good shot, eh. Feel free to print it out and frame it. I won't even charge you for it. Well, I have a ton of great photos from our trips to Oruro, La Paz, Copacabana and Isla del Sol. So where are they? Honestly, I am too exhausted to post them. 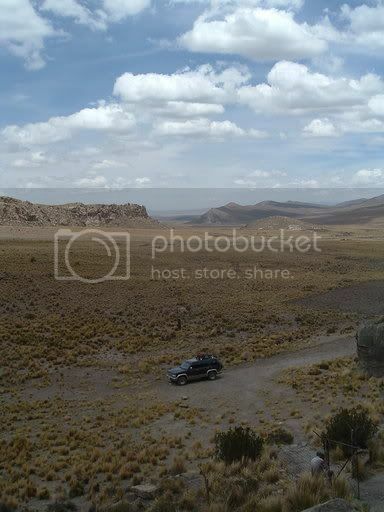 You see, to post photos I need to go to Megan´s school because the connections at Cocha´s 8,000,000 internet places are all deadly slow. Our house is at the bottom of a hill. To get to Meg´s school, I need to walk up our big hill, then walk 2km down the main street, then up a huge hill to the school. That is a lot of hills at 8,500 feet when it is 90 degrees out (summer here, remember). Why so tired? First, Megan and I both are suffering from insomnia. Lots of great conversations at 3AM, at least. Plus, we all have stomach amoebas that we can´t shake. The amoebas make you feel full and bloated all the time, with no apetite at all. So, even though you are shaky with hunger, you can´t eat much. So, that fatigues you. And the food is so bad here that even if you soak everything in bleach and eat only from your own kitchen, you still get sick. The only real way to shake the amoebas is, well, to move back to the States. Meg and I have lost like 35 pounds combined in the past few months -- forget Atkins, I am going to market the Amoeba Diet when I get back. So, we are just a bunch of amoeba-ridden insomniacs. Illegal immigrant amoeba ridden insomniacs, that is (despite 35 visits to immigration and related government entities, each visit taking up to 4 hours, with our children present each time, and the expense of over $1,000, we have yet to get our 1-year visas). The next morning we kill visiting Casa de la Liberdad (the ¨Liberty House¨), which is basically the Bolivian equivalent of Fanuel Hall in Boston. Now, you need to be careful when it comes to Bolivia and independence, as the question always arises as to ¨Independence from whom?¨ Bolivia has had something like 150 revolutions in its history, which may be more than one revolution per year of existence, but I am not sure. Anyway, this is the building where independence from the Peruvian bastards was cemented. Mac is in a pissy mood, so Megan catches most of the tour while I hang with the kids in the House´s beautiful courtyard. After a quick lunch spent mostly deflecting the world´s most aggressive shoeshine boys -- I almost wanted to say yes to one to see how he shined my dirty suede hiking boots -- we hoofed it back to the top of the city. The view up here is just too much for words. Not just the best city view I have ever seen, but perhaps the best I may ever see. We stood there speechless for a good ten minutes. It is worth it to travel all the way down here just for this. The Monestary of the Recoleta sits up here too, and is supposedly beautiful and interesting. It was also supposed to be open, but it wasn´t. Our real objective, anyway, was the Museo de los Ninos Tanga Tanga (the children´s museum) next door. Tanga Tanga was built by a gringo-lead foundation and looks it. Inside, it compares favorably to OMSI or any of the best US children´s museums, with one exception: it is broken. That is, despite being just a few years old, many of the exhibits are already broken and have not been fixed. We see this a lot in Bolivia -- there is just no money for regular maintanance, which leads to premature aging. For instance, we were shocked to learn that a restaurant we ate at in La Paz last week was just 6 months old -- how could it fall apart so quickly? Still, there is much to do here. We enjoyed the terraces behind the museum, which demonstrate and explain each of Bolivia´s diverse climates, from jungle to high mountains. Inside the museum, Jane and Chippy pass an afternoon painting, reading and playing with blocks. Many of the exhibits pertian to sustainable energy, which fascinate me (despite the fact that none of the exhibits work). Dinner we take at Cafe Mirador, a certified first rate gringo hangout, which sits just behind the museum and features that great city view I told you about. We watch the sun set while enjoying bowls of delicious pasta (and it is very hard to make good pasta at this altitude -- the water doesn´t get hot enough to properly cook the noodles). A group of Tarabuco musicians play. We then walk home in the dark, stopping along the way to check out Iglesia San Lazaro (which dates to the mid-1500´s) and Iglesia San Francisco (circa 1539). The interiors of Bolivian churches are as fascinating as their outsides, usually featuring an enourmous gaudy alter of gold and intricate woodwork. The churches are heavy on idolatry, with as many as two dozen life-size statutes of saints installed at various points. I guarantee you have never seen anything like this in North America. I get a kick out of a sign in San Lazaro that pictures a cell phone with a line through it and the words ¨God doesn´t call you on your cell phone.¨ Amen. After breakfast our last morning we run into a guy from Tarabuco, which is a nearby village famous for its textiles. He has a couple of their distinctive hats and wants to sell us one. We´re not in the market for a hat, but ask if he has any blankets. He does, and takes off a gigantic pack to show them to us. These are actual handmade garments worn by people in the village, and are just beautiful. We select one we want and quickly make a deal for it. Photo: Jim, Jane and the Tarabuco man. It is Monday and more things are supposedly open. 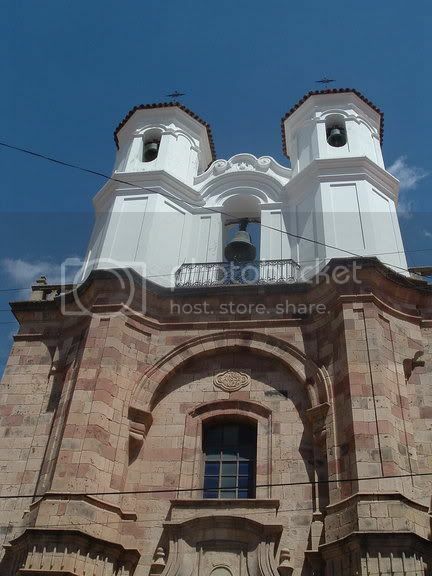 We head to Iglesia La Merced, supposedly possessing the most beautiful interior of any church in Bolivia. Contrary to what the Lonley Planet says, it is closed. So too is Convento San Felipe Neri (circa 1795) across the street. Even from the outside, Neri is stunning, with its brown sandstone base and bright white towers. Too bad we didn´t get to see its famous interior courtyard. 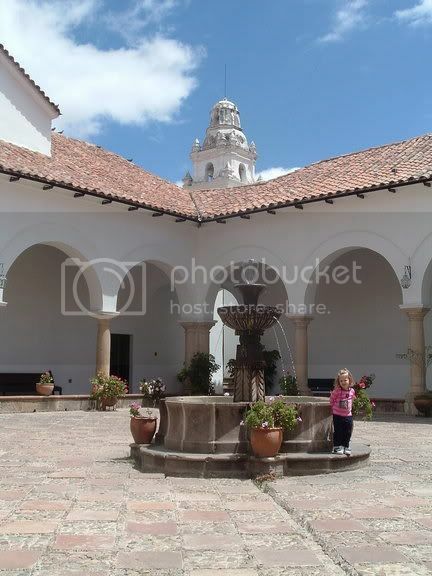 We decide to walk a few blocks to the Museo Charcas, a trio of museums in a beautiful old colonial building. We first visit the colonial art gallery. Lots of religious related paintings and statues. I am impressed by the diverse range and sheer quantity of work attributed to the artist Anomino. It takes me to the end of the museum to realize that means ¨Anonymous.¨ Duh! Our last afternoon is spent hunting for more textiles. We hit a row of artisania shops around the corner from our hotel. In one we spent almost an hour hunting through stacks of blankets. We probably took 30 out to investigate further, bringing many out into the street to see in better light. We even accidentally wake up the owner´s 2-year-old daughter who was sleeping on the floor in one corner of the shop. We are so preoccupied with finding the perfect blanket, that we don´t really negotiate the price much. The one we settle on is 200B, or about $25. Not bad for a handmade blanket. We go to the ATM to get some money. ¨Do you think it is too expensive,¨ Megan asks me. ¨Trust your guy,¨ I tell her, like always. So we take a left hand turn back towards our hotel. On the way, we see another guy from Tarabuco with a big sack on his back. We ask him to come back to our hotel and show us what he has. We quickly find a blanket we like. He wants 200B for it. We tell him 150. Eventually we settle on 170B. As soon as we had struck that deal, yet another Tarabuco guy approaches us. He throws down his pack and immediately rips out a blanket. It is more beautiful than any we have seen. ¨Ooh, I want that one,¨ says Megan. ¨I´ll give it to you for 170 too,¨ says the guy. The guy is a bit aggressive, which flusters Megan. Plus, we already have all the blankets we intended to buy. Megan tells the guy, ¨100B. That is all we will give you.¨ With that, she scoops up Mac and Jane and disappears into our hotel, leaving me standing there with this guy. This guy has a baseball-sized wad of coca in his cheek. I can smell the herbal aroma heavy on his breath. ¨170,¨ he pleads with me. ¨That is very cheap. Much work to make this.¨ He points out the admittedly beautiful detail. Green flecks of coca dot his lips. ¨100. No more.¨ I tell him. ¨100. Wife say 100. No more.¨ It goes on like this for some time. Now, it is easy to negotiate when you do not have any more than 100B in your pocket, and your wife has told you not to spend any more anyway AND she is still pissed at you for losing $100. I hand him 100B, about $12.50, and take my beautiful handmade blanket. ¨120. Beautiful. Much work,¨ he pleads one last time. I start to hand him back the blanket and reach for my money. Reluctanlty, he puts the money in his pocket and starts reassembling his pack. I quickly dart inside the hotel to show Megan my bounty, leaving the peddlar at the door. Note: If you scroll back through the archives, you will find a link to all of our photos from this trip. A little dose of perspective for those whose day was ruined because Starbucks put too much foam on their caramel latte. We have been working for 6 months now to get our one year visas. Yeah, 6 months to get a one year visa and we still have a long way to go. So we go to the police station this morning to get some paperwork done for the kids. HUGE lines wrapping around the building. Guess they have to do with a Bolivia-Spain immigration crisis. So our guy bribes a cop to let us go to the front of the line. Mission one accomplished. We then go to immigration. The department we need to transact with decided not to show up today. No one knows why. Our guy says he will go there tomorrow and see if they are in. If so, he will come get us. We are starting to wonder whether Megan´s two year contract will be up before we get our immigration straightened out. Most of our appetites are coming back as the anti-parasite medication kicks in. Megan still cannot eat much. I am on my way to the supermarket. I hope the lines are not too long. You see, there is going to be a national shutdown tomorrow because of all of the protests over the rise in gas and diesel prices. No stores will be open. We´ve been warned to stay well clear of the protests, which should not be a problem because they will be downtown and we are a few miles north of there. Bus fares have already gone up 50-75% here as a result of the rise in gas prices. Did I mention that Mac chipped one of his two front teeth pretty badly? Has nothing to do with living in the third world, but he looks funny. We are calling him ¨Chippy¨ now. We´re finally back from an exhausting 10 day trip to La Paz and Lake Titicaca. 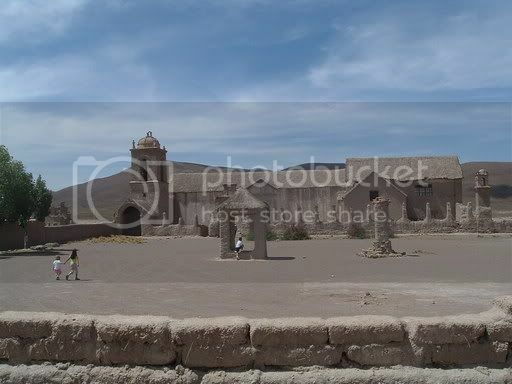 I´m going to get some pictures up later this month, along with the Oruro ones. To me, the bloggable part of the La Paz trip was our return from Isla Del Sol, on Titicaca, to La Paz. There was a nationwide transportation blockade that day, and it made for an epic trip. Unfotunately, the trip was marred by a rather scarry and disturbing incident that day in the hills above Titicaca, and Megan has asked that I don´t write about it so I won´t. La Paz is an unremarkable city set in one of the most amazing locations on earth. An interesting contrast of beauty and ugliness. Better food than Cocha, though. Oh, and most of the museums were closed for the holidays. I mean, people don´t travel at the holidays, right? Isla Del Sol is beautiful, tranquil, and filled with the kindest, warmest human beings on earth. But at 13,500 feet, the altitude killed us. This is the trip that keeps on giving, as that delicious, clean Bolivian food has given us all stomach parasites. And we came home to find a dead and rotting frog had washed into our water tank. Still, it is great to be home. In the future, we have decided that we will not take the kids on trips of more than 5 days here. The bad food and high altitude are too hard on them (we spent a good portion of the ten days at over 12,000 feet). Our trip to Sucre, ¨The White City of the Americas,¨ got off to a pretty bad start. Somehow I had lost $100 between the airport in Cochabamba, and our hotel in Sucre. $100 is a serious wad of cash when you are travelling down here, and Megan was piiiisssssed at me. ¨That´s it. You are no longer allowed to carry money,¨ she tells me, and promptly stuffs what remains of our bankroll into her bra. We´re in our room at the Grand Hotel, an old but nicely restored place a block off Sucre´s main plaza. The 20 or so rooms are set around a beautiful courtyard filled with plants and a big fountain. A sign in one corner of the courtyard commemorates the night Che Gueverra spent here all those years ago. $12.50 a night for the 4 of us (including breakfast) -- not bad. The pie has Bolivian cheese, and you cannot make anything resembling a pizza with Bolivian cheese. The good places here all use imported mozarella. The sauce is sticky sweet. The spices taste like sour cream and onion potato chips. The crust is a very bad ¨ready-made¨ crust bought from the supermarket. I am starving but cannot choke down more than two bites without gagging. In short, in a country known for having horrible food, this is the worst meal I have had in my entire life. And even those two bites are a mistake. I am up all night with horrible diarrhea and nausea. The next day is saved from being a total bust only because I had my prescription for ciproflaxin with me. Trust me on this: do not travel to a 3rd world country without your ciproflaxin. The single best and most effective drug in the world. Not to get too personal on you, but in 10 minutes ciproflaxin took me from horrible diarrhea to not having a bowel movement for 3 days. With me all fixed up, we make a quick trip Saturday morning to Sucre´s market, which is partly open-air and partly housed in a building that resembles a parking garage or maybe a decrepit old northeastern hockey rink. We pick up some bread and fruit and have a small breakfast back at the hotel. After breakfast, we decide to visit El Museo de Arte Indigenia ASUR (the indiginous textile museum). Now, we have to call our shots carefully. 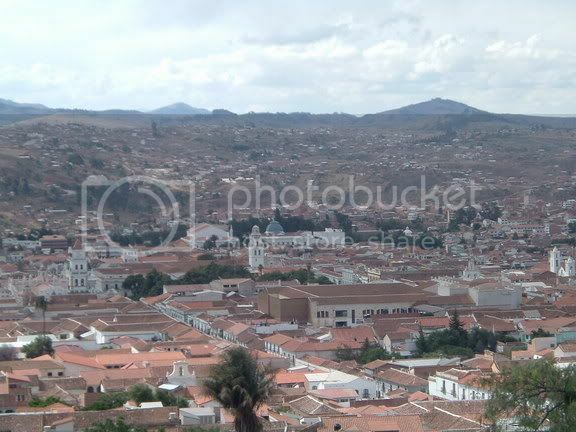 Sucre is perhaps Bolivia´s number one tourist destination. But Bolivia, being either comfortable in its own skin or just stupid, depending on who you ask, isn´t willing to go out of its way for anyone. 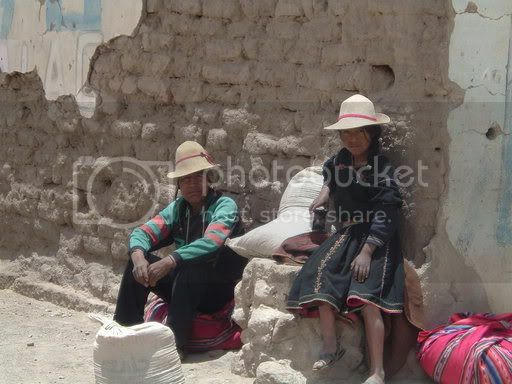 I mean, tourism is really Bolivia´s only shot at escaping its chronic poverty. This place is a tourism goldmine waiting to explode. But with the exception of 3 hours on Saturday morning every tourist attraction in town is CLOSED ON THE WEEKEND. I mean, Saturday and Sunday aren´t big days for tourism, right? Reminds me of the line in ¨This is Spinal Tap¨ when the band´s Boston gig is cancelled. ¨Don´t worry, Boston´s not a big college town,¨their manager assures them. Anyway, by daylight Sucre´s beauty is clearly apparent. Set in a valley at about 8,600 feet, the town climbs the hillside. Buildings are all old, colonial and painted white. Streets are narrow and often cobbled. The roofs are all red tile. Ancient churches dot every other corner. This is without question one of South America´s most beautiful cities. ASUR is near the top of the city. We start climbing in a light drizzle. Jane is on my shoulders and Mac rides in the Kelty on Megan´s back. As we climb higher, the city unfolds below us. It gets more amazing with every step. We finally get to ASUR at 9, and it is closed. Suckers -- we relied on the Lonley Planet again. The museum doesn´t actually open for another half hour. We kill time by walking across the street to the Santa Theresa convent. Santa Theresa is home to an order of cloistered nuns. The concept of cloistered nuns freaks Megan out. ¨You mean they can´t leave? Ever?¨ The building dates to 1655. My favorite thing in the world is Latin American churches. So, Sucre is heaven. The church is closed, but we poke around a bit. Alongside the convent is a lovely gas-lit alley. Until the 1960´s the alley was paved with human bones in the pattern of the cross, apparently to help you contemplate the inevitability of death. It is now paved in cobble stones. I look closely, hoping some bones have been left behind, but see none. ASUR is finally open so we ramble back across the street and go in. 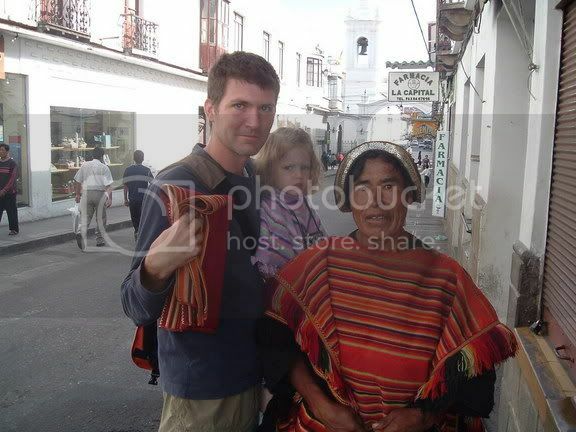 Megan and I both love Bolivian textiles -- the designs, the colors, the craftsmanship. My favorite kind of art. So, ASUR for us ranks up there with Bath, Maine´s maritime museum as one of the best museums we have been to (and we have done all of the Smithsonians). Like Bath´s museum, ASUR succeeds in bringing the art to life. Apparently at one point Bolivia was in danger of losing its textile history. That is, no one was making this kind of art anymore. What ASUR did was succeed in reviving these traditions. They found an expert who could teach local workers how to make textiles in the traditional manner and designs of their ancestors. The expert taught a group of artisans, who in turn each taught other groups. Today there are some 1000 artisans creating textiles in the ASUR program. ASUR, in turn, sells the artisans´ work at the museum and returns the majority of the proceeds to the worker. The museum itself displays artifacts dating back to 400 AD. The antique pieces are interspersed with examples of modern work and explanations of how the textiles are made. There is something in the red and black chaos patterns of the Jalq´a region that I love, while the bright colors and symetry of the Tarabuco pieces draw Megan. In one part of the museum 3 artisans work on looms creating pieces and are happy to answer your questions. 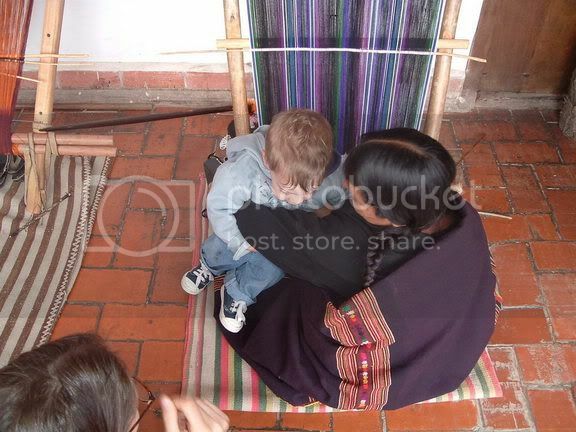 Photo: Little Papi gets up close and personal with a Tarabuco artisan. Now, I´m not going to tell you Mac is Brad Pitt Jr., but the kid is a chick magnet. Everywhere we go, girls can´t leave Little Papi alone. An artisan from Tarabuco won´t rest until Papi sits on her lap for a spell. He reluctently agrees. On our way out, we stop at the museum store and are stunned not just at the quality of the work for sale, but at the prices -- dead reasonable for a museum quality piece. We go back and forth over whether we want a Jalq´a or Tarabuco piece. We later decide that on our next trip we will get one of each. Back at the hotel, Mac is met by the Little Papi Fan Club, Sucre Division. One girl takes him from Megan´s arms and disappears into the courtyard. Everytime we return to the hotel, Mac is met by a throng of friends. People love kids here, so Jane and Mac really break down a lot of barriers for us. In fact, we are pleasantly surprised by the warmth and openness of the people of Sucre -- in sharp contrast to the cold and unfriendly Cochabambinos. After a bit of rest, we walk up to the main plaza to catch something called the ¨Dino Truck,¨ which is the only thing open on Saturday afternoon. The Dino Truck is an old farm truck with a bunch of seats thrown in the back. Packed with a mix of Bolivians, Aussies, English, Chinese and Yanks, the trucks huffs and puffs its way up Sucre´s steep hills to Cal Orka, right outside of town. 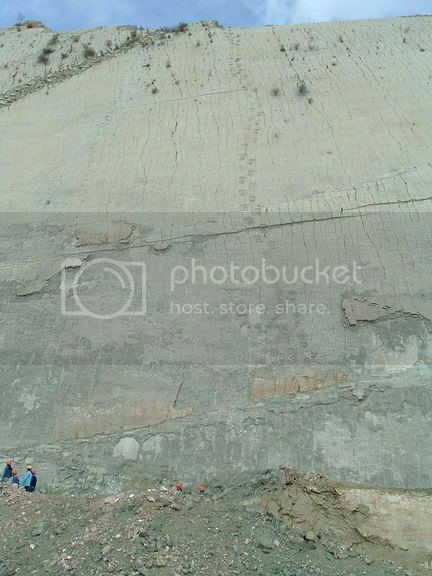 Cal Orka is the world´s largest paleontological site; in layman´s terms -- dinosaur tracks! Cal Orka is also home to the National Cement Factory. A few years ago, workers here uncovered a nearly vertical rock face covered with almost 5,000 (yes, FIVE THOUSAND) dinosaur footprints from over 320 different dinosaurs. The gray wall is the size of 4 football fields. Photo: Part of the wall. Can ya see the tracks? No? Squint! The theory is that this wall was the shorline of a massive lake all those years ago. Dinosaurs would come to the shore to drink water, and leave their footprints in the mud. Whatever killed the dinosaurs off killed them off, and the prints were left frozen in time. Until this site was discovered, scientists did not know that so many different types of dinosaurs were alive at the end of the dinosaur age. The wall is everchanging. It is very fragile, so layers of the wall are continually sloughing off. ¨Last week there was a huge T-Rex print right there,¨ says our guide, pointing to an empty spot on the wall. On the other hand, as layers come off, more prints are often uncovered beneath. It doesn´t help that this site is still a working cement factory. Our guide tells us that the explosions from mining and the vibrations from the heavy equipment accelerate the errosion. If nothing is done to secure the wall, the prints will be completely erased withing 50 years. They need money to save the wall, and the government either doesn´t have it or isn´t willing to spend it. Now, I am no dinosaur geek. But it was pretty cool to stand there and look at a 100 foot long set of prints left by a brontosaurus and her baby millions of years ago. . . .
NEXT: Jim bargains for textiles with Tarabuco locals . . . and will the Filiault´s find something to do on Sunday? ?